Qatar has signed a letter-of-intent (LoI) with the U.K. for the purchase of 24 Eurofighter Typhoon multi-role fighters from BAE Systems. According to an official statement released by the Government of the U.K., the document was signed by the respective Ministers of Defence (MoD) of both countries – Sir Michael Fallon and Khalid bin Mohammed al-Attiyah – on Sunday, September 17. Specific details, such as the pricing or munitions package, were not disclosed. It is possible that the LoI is a basic framework that will launch technical and contractual negotiations. The Eurofighter Typhoon’s current iteration, the Tranche 3, first flew in 2013. Its marquee features include – among others – the CAPTOR-E active electronically-scanned array (AESA) radar and compatibility with stand-off weapons, such as cruise missiles, for deep-strike missions. Between the Eurofighter Consortium members, 112 Typhoon Tranche 3s were ordered in 2009. This is Qatar’s third big-ticket fixed-wing combat aircraft purchase, following deals for 36 Boeing F-15QA in July 2017 and 24 Dassault Rafale in December 2015. It also makes Qatar the first country to potentially operate two competing “Euro-canard” fighter platforms simultaneously. If brought to fruition, Qatar would become the fourth country in the Gulf Cooperation Council (GCC) to operate the Eurofighter Typhoon. 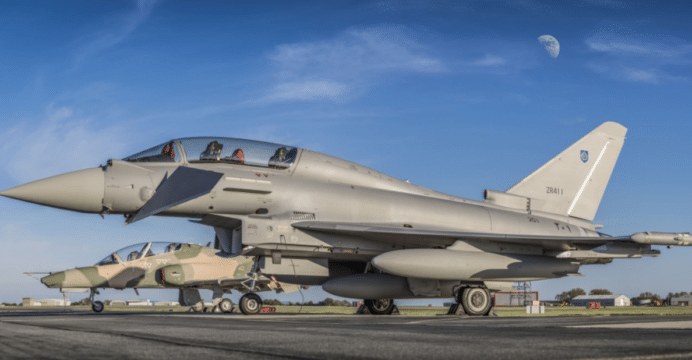 It would also be the Eurofighter Consortium’s second new batch order, following Kuwait’s purchase of 28 Typhoon Tranche 3, reportedly valued at nearly $9 billion U.S.
Subassemblies manufacturing of the Typhoon will be suspended in three of the four Consortium members until 2018, when Kuwait’s order will push a re-activation of the production process (Defense Aerospace). The Consortium has been seeking new export orders. In the process it has worked to reduce production costs and long-term lifecycle and maintenance costs (e.g. BAE Systems’ TyTAN program for Royal Air Force Typhoons, which aims to reduce costs by 40%). If Qatar is to follow Kuwait’s order, then Typhoon production would extend into the 2020s. BAE Systems is also marketing the Typhoon to Belgium, Finland and Poland. BAE had also pitched the Typhoon to Malaysia (until Malaysia shelved the program in June). The Typhoon is reflective of Qatar’s determination to both recapitalize and vastly expand its military in all relevant domains, especially in terms of airpower. With three distinct long-range multi-role fighter assets and the Boeing AH-64E Apache Guardian in the order pipeline, Doha is on the path of building relatively sizable air defence, deep-strike, offensive air and close air support capabilities. Granted, questions remain in regards to shoring up the requisite human resources capacity, especially to sustain the maintenance needs of each sophisticated platform and to demonstrate an active operational tempo. That said, by virtue of its contracts, Doha has built defence and commercial bridges to Washington, London and Paris, which could be foreign relations factor in of itself.